Finally had shifters and derailleurs added back to the old Raleigh. 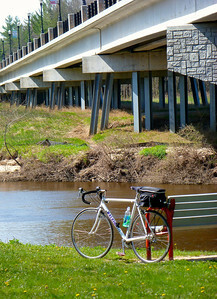 Took it from Midland to North Bradley, and back past the tridge for 31 miles. 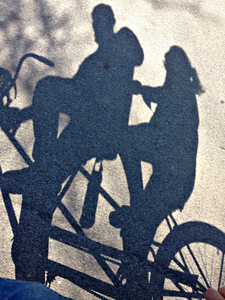 Then later we jumped on the tandem for a few more miles in the neighborhoods. 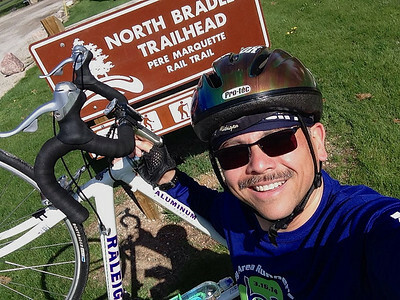 Heckuva head wind out of Midland, but made it to North Bradley for the first trip of the year. Never really looked at the new M30 bridge from underneath before. Seems to be a nice, comfortable RailTrail rest stop there. 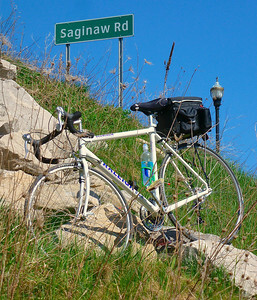 No matter where I go, there is always a connection to Saginaw. Weird. Isn't that transmission a beautiful thing? After running a one-speed for so long, being able to shift gears was simply amazing. 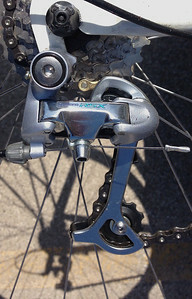 And my favorite mechanic at CycleFit in Saginaw made this classic old bike shift even smoother than when it was new. Also got in the first tandem ride of the year to close out the day. Life is good.